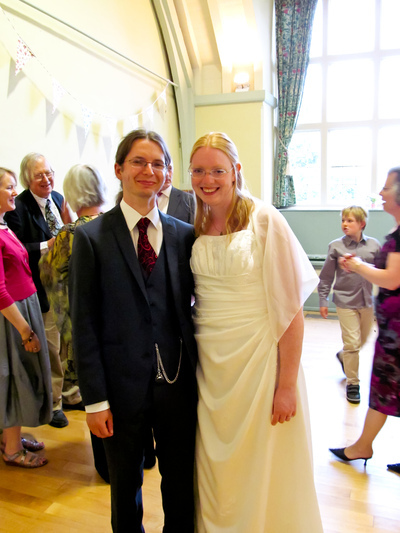 Congratulations must go to Dr Perkins who somehow convinced a lovely woman to marry him. They did that a couple of weeks ago in Denmark (Ed having proved to the Danish authorities that he wasn’t already married!). This weekend saw the UK leg of the celebrations. That found Jan and I navigating trains and a bus to Sudbury then Long Melford, in Suffolk. From there we thankfully didn’t have to think to much as we were finally taxied to Hartest (it’s quite small)—at least our taxi didn’t get lost on the way. Anyway, there was food and drink and some strange songs (part of the English/Danish cross over theme). Despite this being after the honeymoon the two were obviously still very happy and in love. Long may it continue! You may subscribe to IMS_Blog using the RSS Feed, the Atom Feed or by email. 365 Update and Oops and Done! © Ian Scott. Powered by Movable Type 3.2. This blog uses valid XHTML 1.0 Strict and valid CSS. All times are local UK time. For further details see the IMS_Blog about page.. All my feeds in one.